"My first love was hats,” carol reuter recalls. at one time, she owned 2,000, from pillbox to picture hats. 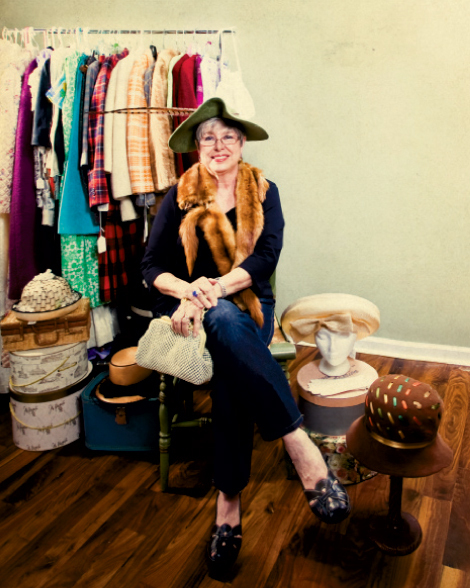 For more than 30 years, Reuter has collected vintage clothing, handbags, jewelry, gloves, buttons, shoes, lace, and trims, which she sells at Bryant Antiques in Asheville under the moniker A Woman’s Touch. That expertise can be attributed to her past career working with vintage pieces for the Smithsonian Institution. In 1983, Reuter left a 10-year position teaching art, industrial art, and home economics at a Maryland middle school to take a job as a model maker for the D.C. museums. For 23 years, she used fiberglass, auto body putty, and plaster to create mannequins, props, and models of every ilk, from dolphins to celebrities. “You just never knew what they were going to ask you to do,” she says. But it was her work reproducing period clothing for displays in the Museum of American History that fueled her budding interest in vintage duds and accessories, which she bought and sold at antique malls and vintage showcases.